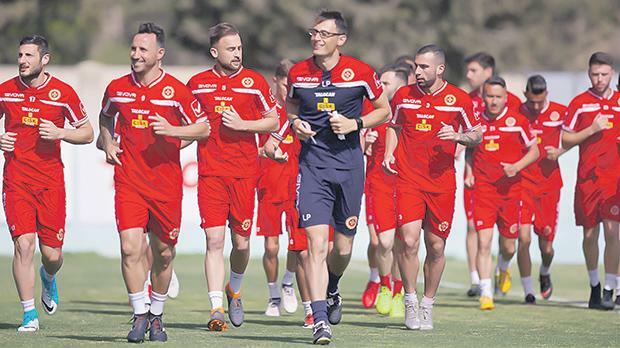 Malta coach Ray Farrugia has called on his established players to take the young members of the national squad under their wings as they prepare to open their UEFA Nations League commitments next month. Farrugia, yesterday, named a provisional squad ahead of Malta’s opening double header in the newly-launched UEFA competition when they take on the Faroe Islands on September 7 before hosting the Azerbaijan at the National Stadium four days later. With just less than two weeks from making his competitive debut as Malta coach, Farrugia is looking to step up his preparations for the upcoming matches as he looks to help the team make a positive start to the competition. Farrugia is boosted by the return of several established players in his squad who missed last June’s training camp in Austria. Pistoiese defender Zach Muscat, midfielders Johann Bezzina, of Hibernians and Sliema Wanderers’ Ryan Fenech and striking duo Andre Schembri, of Apollon Limassol and Sliema’s Jean Paul Farrugia have all been included. The Malta coach has also drafted in three U-21 players in midfield trio Jake Grech, of Birkirkara, Hibernians’ Joseph Mbong and Juan Corbalan, of Gżira United. Rowen Muscat, of Valletta, and Gżira’s Roderick Briffa have both been included despite being currently sidelined with an injury as the Malta coach hopes they declare themselves fit for the two qualifiers. “I am really looking forward to the start of the UEFA Nations League,” Farrugia said. “Our training camp in Austria last June was an excellent experience as the players have not only performed well in the friendlies against Georgia and Armenia but they have also go to know better what we expect of them. “I have named a squad which has a blend of youth and experience and hopefully they will form our backbone for the upcoming years. “As a national coach I expect the experienced members of the team, such as Michael Mifsud, Andre Schembri, Andrew Cohen and Roderick Briffa, to take the youngsters in our squad under their wings and help them to develop into established national team players. Farrugia said that he is confident that Malta can enjoy a positive start to the UEFA Nations League campaign. “I have always been a positive person and I truly believe that we can get good results from our upcoming matches against the Faroe Islands and Azerbaijan,” Farrugia said. “However, the most important thing that all the members of our squad are professional in their approach and that we are united in our goal of attaining the best possible result for our national team. Goalkeepers: Henry Bonello (Valletta), Andrew Hogg (Hibernians), Steve Sultana (Balzan). Defenders: Ferdinando Apap (Victoria Hotspurs), Andrei Agius (Hibernians), Steve Borg (Valletta), Ryan Camilleri (Valletta), Clayton Failla (Floriana), Michael Johnson (Balzan), Joseph Mbong (Hibernians), Zach Muscat (Pistoiese), Joseph Zerafa (Valletta). Midfielders: Johann Bezzina (Hibernians), Roderick Briffa (Gżira United), Juan Corbalan (Gżira United), Paul Fenech (Birkirkara), Ryan Fenech (Sliema Wanderers), Jake Grech (Birkirkara), Rowen Muscat (Valletta), Steve Pisani (Floriana), Dunstan Vella (Hibernians). Forwards: Andrew Cohen (Gżira United), Alfred Effiong (Balzan), Jean Paul Farrugia (Sliema Wanderers), Michael Mifsud (Valletta), Andre Schembri (Apollon Limassol).